FTV Capital Leads Growth Equity Investment in True Potential - Berkery, Noyes & Co., LLC. 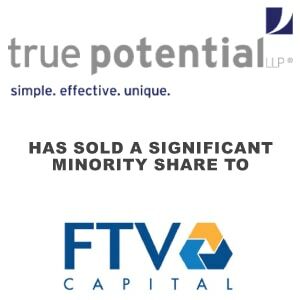 LONDON — January 28, 2016 — True Potential LLP, the leading UK-based integrated investor and wealth management technology platform serving advisers and retail clients in the UK, today announced it had sold a significant minority share of its group business to FTV Capital, its first institutional investor. The transaction values True Potential in excess of £150 million. 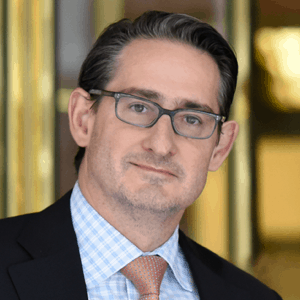 In addition to the funding, FTV Capital’s Brad Bernstein and Kyle Griswold have joined the company’s board of directors. Founded in 2007, True Potential LLP has built one of the UK’s most innovative financial services groups. The company currently provides products and technology to nearly 20% of UK financial advisers and serves the wealth management needs of over 2.1 million private clients. A robust set of tools, processes and advice to ensure compliance requirements are always met. A wide range of investment options, including self-directed options featuring impulseSave®, the world-first technology enabling top-up investments. True Potential was represented by Berkery Noyes & Co, LLC, a New York-based investment bank, and Ward Hadaway, a Newcastle, Leeds and Manchester-based law firm. Headquartered in Newcastle upon Tyne, True Potential LLP is one of the fastest growing and most innovative financial services groups in the UK. The financial services group provides technology and business support services to UK financial advisers and wealth management services for private individuals. True Potential has been ranked as the fastest growing financial advice and technology services company headquartered outside London in the 2014 and 2015 Deloitte Technology Fast 50. The ranking of the 50 fastest-growing technology companies in the UK are based on percentage revenue growth over the last five years. True Potential is one of only 67 UK companies to appear in the Deloitte Technology Fast 500 EMEA 2014, a ranking of the 500 fastest-growing technology companies across Europe, the Middle East and Africa. Rankings are based on percentage revenue growth over five years. True Potential advanced from position 431 in the 2013 list to 204 in 2014. True Potential has partnered with the Open University to launch the True Potential Centre for the Public Understanding of Finance. PUFin is a pioneering Centre of Excellence for research in the development of personal financial capabilities. PUFin is working to improve public understanding of personal finance through its research and the delivery of free modules providing individuals with the tools to make sound financial decisions. True Potential is leading the campaign to close the Savings Gap in the UK. We believe radical ideas and innovative solutions are needed in three areas to close the gap: agile regulation, better financial knowledge and understanding, and technology. The study is one of the largest of its type ever commissioned into consumers’ financial behaviour and attitudes, involving more than 16,000 adults across the UK to date. FTV Capital is a growth equity investment firm that has raised over $1.8 billion since inception to invest in high-growth companies offering a range of innovative solutions in three sectors: enterprise solutions, financial services, and payments/transaction processing. FTV’s experienced team leverages its domain expertise and proven track record in each of these sectors to help motivated management teams accelerate growth. FTV also provides companies with access to its Global Partner Network, a group of the world’s leading enterprises and executives who have helped FTV portfolio companies for more than a decade. Founded in 1998, FTV Capital has invested in 89 portfolio companies, including companies in the financial services ecosystem such as Aspire Financial Services, ETF Securities, Financial Engines (IPO, March 2010), IndexIQ (acquired by New York Life Investment Management), InvestCloud, PowerShares Capital Management (acquired by Invesco), Swan Global Investments, and VelocityShares (acquired by Janus Capital). FTV Capital has a track record investing in the UK, including investments in World First and Apex Fund Services. FTV has offices in San Francisco and New York. For more information, please visit www.ftvcapital.com.